This is a story about a lame man whose friends believed that Jesus could heal him. 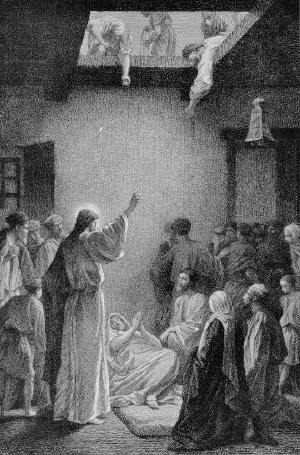 At last they found a way to get their friend before Jesus by opening the roof and letting him down by ropes attached to his bed. But Jesus didn’t heal the man’s lameness — he forgave his sins. It’s a rhetorical question. Both statements would be impossible for anyone but God. If Jesus had authority to make the lame walk by merely uttering the word, then he also had authority to forgive sins, because the power to do either was in God’s domain, not man’s. Today, a team of doctors might be able to restore the ability to walk to people with certain kinds of problems. Even after the operation, however, the person would still need a long period of therapy and rehabilitation. But no one, not even the finest doctor, can simply say, “Rise up and walk,” and cause it to happen. Which is easier to say to a paralyzed man, “Your sins are forgiven,” or “Rise up and walk”? It seems to me that “Your sins are forgiven” is easier. Why? Sins are between people and God, and their forgiveness is therefore invisible, like God is invisible. You can’t see or taste the forgiveness of sins. You can see a leg fixed. It’s physical. You can see the withered leg; you can see the whole leg; you can see the difference. Anyone can say, “Your sins are forgiven,” and there is no immediate evidence that the person is a fraud. If someone says to a paralytic, “Get up and walk,” the evidence for or against the person’s authority over sin is immediate and visible to all. The forgiveness of sins is something that becomes real to you as you believe it, not as you see it. The lame man in this story could not see his forgiveness; he could only decide whether to believe that what Jesus said was true. To believe it would lift a great burden of guilt and fear from his shoulders. It would bring joy, peace and comfort. To not believe it would leave him feeling the same old estrangement, alienation from God and fearful expectation of judgment. The man’s joy in being forgiven was experienced through faith, not through sight. The healing of his legs, on the other hand, was experienced through sight — he didn’t need faith to walk; he simply had to get up. Either way, it takes God, for no human could heal the legs or forgive the sins. That was Jesus’ point. Sure, it’s easy to say, “Your sins are forgiven,” but how can anyone know for sure that the sins really are forgiven? So Jesus healed the man to show that when he says, “Your sins are forgiven,” they really are forgiven. Salvation is by grace through faith. We receive it by grace — we don’t do anything to get it; it’s God’s gift to us, free and clear. We don’t get any document, title or deed as proof that it is done. We just have to believe it or not believe it. If we don’t believe the gospel — this amazing good news that in Christ’s life, death and resurrection we are saved — how can we experience that salvation? How can we enjoy and benefit from the knowledge of something if we don’t even believe it is so? Unless we believe the gospel is true, we will go on living as though Christ had not died and been raised for us. But when we believe the gospel, we are overwhelmed by the joy of what Christ has done for us. We begin to live abundantly in his love — resting in his love for us as well as showing his love to those around us. Can God heal your physical ailments? Yes. Does he heal the physical ailments of everyone who asks? No. What does he say to everyone who asks? He says what he said to the paralyzed man, “Your sins are forgiven.” Which is more important? Jesus told the Pharisees, “But I want you to know that the Son of Man has authority on earth to forgive sins.” So he said to the man, ‘I tell you, get up, take your mat and go home.’” To believers, this is unnecessary. We already believe that the Son of man has power to forgive sins. We don’t need a sign of Jesus’ power to demonstrate the fact that he has authority to forgive sins. We feel it and know it as the Holy Spirit bears witness with our spirit (Romans 8:16). Believers didn’t need visible signs that their sins are forgiven. Signs are usually for unbelievers. Paul was an unbeliever and an enemy of the gospel, in that he persecuted believers. When Jesus appeared to him in person on the road to Damascus, he became a believer. Many others became believers when they witnessed the signs given by Jesus and the apostles. Sometimes, though, we wish we did have a sign, because we fall into doubt about the things God has told us. We sometimes doubt whether God really loves us. We often doubt whether God really has forgiven us. Sometimes we even doubt, though we hate to admit it, whether God is really there at all. And our doubt makes us worry all the more that if God is there, he must not love and forgive sinners and doubters like us. Our Savior is Jesus. Faith doesn’t save us, Jesus does. In our moments of strong faith, we trust him completely and all fear is gone. In our moments of doubt, we fear condemnation. May we learn to trust Jesus to have faith for us when we are in doubt, for it is his righteousness and his faith on our behalf that God accepts. Jesus represents us before God. He stands in for us. And it is for his sake that we are clean and saved. Let our faith be in Jesus, not in our faith. A rumor goes around that if people really trusted God for healing, they would be healed. So when people aren’t healed, they feel guilty. They look for the supposed “secret sin” that is keeping them from being healed. Christian friends and family may tell them they need to pray that God will show them their sins so that he can heal them. They might tell the sick person that he or she needs more faith, and prescribe more prayer and Bible study and fasting as the way to get God to heal them. That’s not gospel; it’s religion. It’s superstition. It reduces God to the level of the ancient pagan gods, tyrants, who cared little for the plight of humans and acted only when they had something to gain, or when a stronger god forced them to. The Father of Jesus Christ is not like those gods. Religion, as a formula for getting right with God, has no place in the gospel. Our relationship with God is not a business transaction: you, human, bring me six chickens and say the magic words and then I will be good to you. Our relationship with God does not and did not start with us. It started with God, God sees it through, and its foundation is his love, not his convenience. The reason we pray, as Jesus did, “Your will, not mine, be done,” is that God’s will for us is unwaveringly good, never bad. God is not vindictive; he is love. In this, in his commitment to love us and see us through all things, he does not change (Malachi 3:6). In this, Jesus Christ is the same, yesterday, today and forever (Hebrews 13:8). That’s what all this covenant business is about — it’s about God’s faithfulness to be our God and for us to be his people. It’s not about our faithfulness, because if it were, it would be over. God is faithful to his word of promise to love us regardless of what we do. If we live as his enemies, in constant ungodliness, giving little or no regard to our Maker and Redeemer and his good plans for us, then our lives can never be anything more than the miserable, selfish stabs at happiness that we can conjure up for ourselves. But God is no less faithful to us, regardless of what we do. He continues to leave his door open and the porch light on, even when we are holed up in our shack with our door barred shut. He stands out there and knocks, even when we put in our earplugs and crawl under the bed. The point is: God is faithful. That’s how he is, and that’s how he will always be. When you look at Jesus Christ, you see how God is. He sacrifices himself for sinners, and calls on the Father to forgive even those whose greed, pride, selfish ambition and jealousy led them to torture and murder him. In that, we all have a stake; we all have greed, pride, selfish ambition and jealousy. But for Christ’s sake, God forgives us. Be cause he is faithful, because he is true to who he is: Lover and Redeemer of his creation. We pray for healing, but we trust ourselves to the One who cares for us. We believe he will do what is right and good for us. We live by faith, resting in his hands, because he is good. Like the paralytic, we know our sins are forgiven, and that’s what really matters. If we are healed physically too, that’s an added blessing. But we should remember that the paralytic died. Lazarus, who was raised from the dead, died. Every person who was ever healed, eventually died, and unless Jesus comes back before we die, we’ll die too, whether we were ever healed of a disease or not. Physical healing is great, and we praise God for the wonderful healings he has given and continues to give, but we look ultimately to something that lasts forever. Like those cited as examples of faith in the book of Hebrews, we look for a better country, a permanent one, a heavenly one, promised to us by the One who is faithful (Hebrews 11:13-16). Praise God, our sins are forgiven! Have you doubted God’s love for you? What do you think caused your doubt? Why do you believe God has forgiven your sins? How would you describe God to a small child? What is the most memorable time in your life when God gave you help?